Would you like to partner with Debt Avalanche and make money too? Whether you’re looking to make a little extra money to pay down your own debt faster or you’re ready to quit your job and start making your own financial security, Debt Avalanche’s Affiliate program can help you. As a Debt Avalanche Marketing Partner, you will receive a commission on all sales of our products that result from your promotion of the Debt Avalanche site. Because Debt Avalanche is a no-brainer when it comes to the 80% of the population of the planet that has debt, when you promote Debt Avalanche, you can rest assured you can grow your income. We pay a generous 10% commission on all subscription products. The more people that sign up under your affiliate link, the more you make. In addition, all of your sales are recurring revenue. When you sign someone up, you not only get paid in the first month, you get paid every single month the member pays for the program. 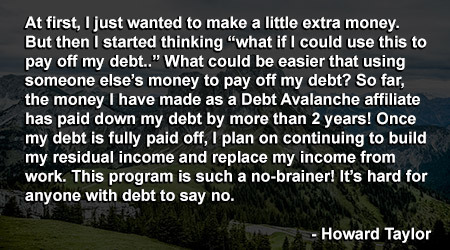 In just a couple of minutes, you can have access to the Debt Avalanche Affiliate Program. The Debt Avalanche Affiliate Program is a FAST and EASY way to make money! "Fast" because it only takes a few minutes to apply to our program. "Easy" because once you become an affiliate, we provide tools and resources to get you up and running. When you request an affiliate link and start promoting, you will be able to offer to all Debt Avalanche programs. As Debt Avalanche offers more services, products and programs in the future, you will automatically be enrolled to offer those as well. See exactly how you are performing in real time. When you want to know how many people have signed up and how much you’re making, simply login and look at your reports. Affiliates are paid each time the member makes a payment! This eliminates affiliates from ever receiving a chargeback from an unsatisfied customer. Payments are made to you securely through Stripe. Once you have signed up, simply login to your profile and setup your Stripe account to get paid every month. Members deal directly with Debt Avalanche coaches and support staff, so there is no need to ever provide customer support for people that purchase from your affiliate links. Whether you would like to put a link on your website, sign people up in person, promote on social media or something else, we will help you with the resources that are right for you to grow your sales and income. How Do I Become a Debt Avalanche Partner? Joining is easy and free. Just fill out the form below to get started FREE today. Once you have registered as an affiliate, login and click your profile link. Connect your Debt Avalanche account with Stripe for us to pay you. Commissions are paid monthly.